Apple’s own Network Utility is pretty handy for basic network troubleshooting, but if you need to go above and beyond what it offers, Daniel Diener’s $20 Network Radar (Mac App Store link) is a powerful step up. 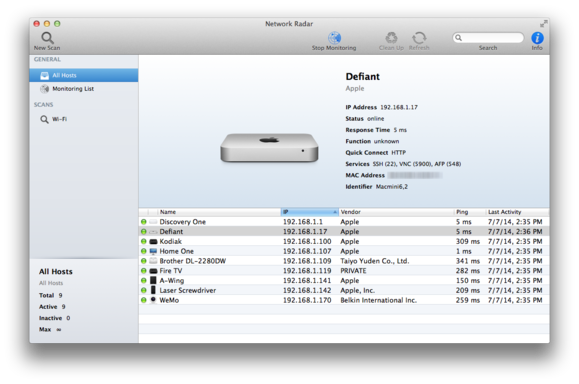 Like Apple’s own app, Network Radar offers many common network tools, including ping, port scan, and whois. But it doesn’t stop there: The app can quickly scan your entire network and display a list of devices on it, along with their IP addresses, what services they offer, and more. If you need quick access via services like Telnet, SSH, or HTTP, you can access those for any device by right-clicking on its entry. One of Network Radar’s most powerful tools is the ability to monitor your devices in real time, and get notifications when they come online or go offline—a great help for troubleshooting, especially for those who maintain a lot of different machines. I also appreciated Network Radar’s robust system of rules, which lets you trigger sounds, emails, and user notifications for certain events on your network. You can limit those rules to only triggering for devices on your Monitoring List, and even then only at particular intervals. Network Radar certainly isn’t a tool that the average user will need, but it can definitely be helpful for the budding network administrator in us, and for those who find themselves troubleshooting network activity.